jackb61sx had the most liked content! Watts did a complete harness for me when I restored my B-61, it was nice quality, easy to follow schematics, looks original and not difficult to install. They are nice trucks the Western Star for dump trucks are a better up grade over other trucks out there. 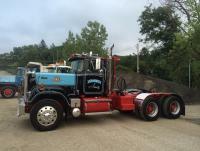 I have driven them and liked the truck but if I was given a choice I still want a Mack Granite having driven both. I had one in the roof of my B and we removed it right away when we got it the truck and started to restore. If I where you buy a small fan they sell and mount it to the Dash, they work much better and you will avoid all the possible rotting issues around it. That truck looks amazing, you need to do a post of pictures from where you started to the finished truck, nice work! I believe we got ours from Watt's, I would check there first. I got my headliner at the time for my B-61 from Watts Mack, have you checked there for a price. Are all those trucks in Josephs building in Manchester? When we did our restoration on my B-61 we made up a punch with a long handle for one person to hold and a large flat spot to hit and I would stand on the frame rail and take full swings with a sledge hammer and just drive them out of the frame and they would fly out when hit naturally we had ground the heads off first. Those that where tougher we drilled out with a magnetic drill. Our frame was pretty pitted when we took the triple frame apart and the parts of the frame that would be seen the inner and outer frame after piming we filled with body filler and sanded and the frame is like glass now. When the truck was taken from our chapter， the only explanation we got was that "under the bye laws no local chapter can retain ownership of a donated vehicle" even though the intent of the family was that the truck remain local. After they took the truck， the chapter stopped its affiliation with the ATHS and reformed under the ATCA. I don't think there are any ATHS around here anymore after the Wellington truck theft in my opinion. They are trying to sell the truck with as little fanfare as they can and by going this route the buyer can most probably if they choose stay out of the bright lites this truck will attract as it did last time they tried to sell it. You are missing the whole point on this particular truck. It was taken by the National from the local chapter under the guise of no local chapter can own a truck, which was not the intent of the family to see it taken and sold by the National headquarters. The truck has a long history here in the Boston area and belongs here. The truck was well taken care of by the chapter, was a regular at truck shows. In my opinion if the truck where anything else but an FJ and was not of such a high value it would never be owned by the National, they took if for its value and what they can reap from it as a "CASH" windfall none of the members will never see. If anything right now the truck should be left in the Mack Museum or where it was at Gary Mahans where atleast the truck can be seen.